There are certain beer styles that speak to us as brewers. Some we appreciate for their balance and restraint, others for their expression of place. 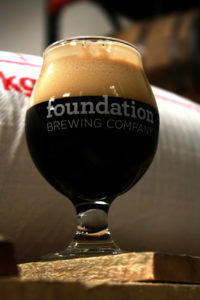 And then there are some styles, like Russian Imperial Stouts, that are about intensity. As brewers, we love the challenge of binding together these strong, bold flavors to make a complex, intriguing, and delicious beer. In February of 2015, we released our Russian Imperial Stout, called Forge, to celebrate our first year of production. We loved making this beer so much, we knew we had to do it again, and we are excited to be able to share Forge again this year! Jet black, potent, and brimming with roasted malt and chocolate flavors, Forge is everything we love in a big stout. However, this year, we are offering a slight twist from last year. We are releasing it in 4-packs of 12 oz cans at the end of December, just in time for New Year’s Eve celebrations.